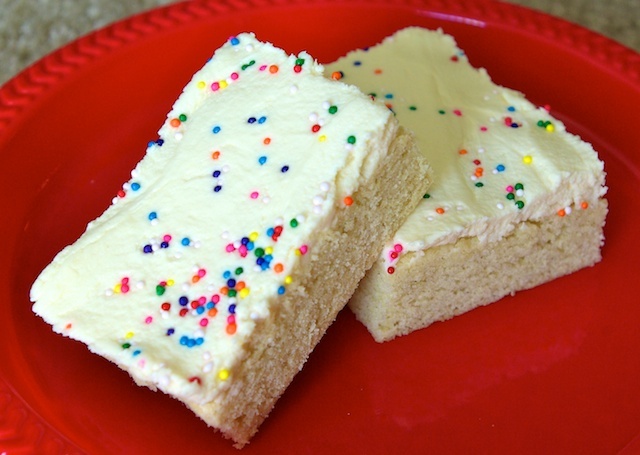 Sugar Cookie Bars…what a brilliant idea! Whip up the dough, press it into a jellyroll pan, bake it up and frost the entire pan! As there isn’t any chilling, rolling, or cookie cutting involved, you save a ton of time. However, you still get all of the delicious goodness of a buttery rich sugar cookie. Yes please. I baked my cookies in a 10×15 jellyroll pan, lined with parchment paper. You could probably cut the recipe down a little bit and bake it in a 9×13 as well, but I haven’t tried. What is your favorite time saver cookie? Let me know below! butter, shortening, and sugar until fluffy. time, mixing well after each addition. ingredients to the wet ingredients. the shortening and butter until light and fluffy. until you reach your desired constancy. 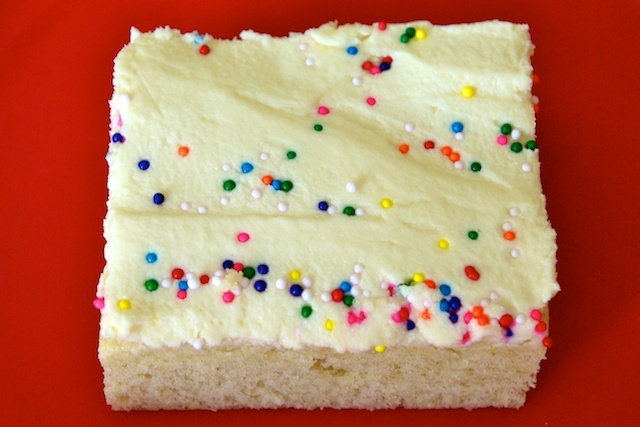 a generous coating of frosting. Cut into bars and devour!